One of the frustrating aspects about renewable energy is that it is a highly technical field but it is followed passionately (and sometimes written about) by people who don’t know the difference between a watt, a BTU, a volt, or any of the mathematical and technical terms that are critical to understanding energy. I was reading an article on LED lighting yesterday that had been mentioned in one of my LinkedIn groups and found that it used one of my pet peeves, mentioning CO2 reductions in the same sentence as energy savings. We should not care what the CO2 savings are when it comes to fossil fuels. All we need to know is that if the fossil fuel consumption is reduced by x%, then its CO2 output will be reduced by a similar percentage. Yet percentage saving are almost never mentioned. Some fossil fuels generate a little more CO2 per BTU than others, but it’s not important in the grand scheme of things. The important thing is that fossil fuels produce CO2 from carbon that has not been in the atmosphere for millions of years and that has the effect of increasing the atmospheric CO2 concentration when they are mined and burned. This is something we should try to avoid, because its consequences could be dire should it change the climate to make our planet inhospitable for humanity. Burning any carbon-containing fuel, including biomass like wood, alcohol, or biodiesel also produces similar amounts of carbon dioxide per unit of energy; it’s just that it is carbon dioxide that was recently in the atmosphere, not ancient carbon hidden under the earth’s crust, so it doesn’t increase the overall atmospheric CO2 concentration. And that is a vital distinction. Most people have no idea how much a ton of CO2 really is. We don’t think of gases in terms of how much they weigh. Here’s a hint: If you’re an American, your fossil fuel per capita allocation is one ton of CO2 into the atmosphere approximately every 2 weeks. A ton sounds like a lot, but it’s not as big as you think when you consider that we each put 24 tons of CO2 into the atmosphere per year. Yes, we need to reduce it, and the only way to do that is by decreasing our overall fossil fuel consumption. OK, enough about ranting about my pet peeve, let’s get on to the LED lighting claims made by the article. The article claimed that LED lighting would save $1.8 trillion, or 1 billion barrels of oil, and 10 gigatons of CO2 over 10 years. I wondered if anyone else bothered to do some simple calculations about these claims, like the fact that $1.8 trillion for 1 billion barrels of oil comes out to $1800/barrel, which is about 40 times its current price. Also, a barrel of oil weighs about 290 lbs, and burning a barrel of oil results in about 900 lbs of CO2. If you multiply a liquid fossil fuel’s weight by 3, it gives you a pretty accurate estimate of the amount of CO2 it generates when burned. Yet the conversion factor for the 10 gigatons for 1 billion barrels implies a yield of 10 tons of CO2 per barrel, or 20,000 lbs per 290 lbs of oil. This is off by more than a factor of 20. It’s hard to imagine LED lighting saving so much money. For now I’ll ignore the fact that oil isn’t used very much for generating electricity. I’ll assume that the author was thinking in terms of “barrels of oil equivalent”. But the money savings don’t seem to hold up to scrutiny either. I wrote an article on CFLs and my findings were that about 9% of electric energy usage in the home is due to lighting. CFLs can cut that by 75%, which means that their overall impact on home electricity use would generate around a 7% savings. That takes the lighting load down to about 2.3% of the total electrical load in a house. A typical 60W incandescent bulb produces around 870 lumens of light. To get the equivalent amount of light, i.e., lumens, from LED bulbs it would cost over $100 compared to $1.50 for an equivalent CFL bulb. It would take a very long time to pay back that difference. A 60-watt equivalent CFL bulb uses about 13 watts, and using the more generous ratio given above (3.3), an equivalent set of LED bulbs would use 4 watts. This is a savings of 9 watts. Assuming a cost of $.10/kWh, it would take 110,000 hours or 12.5 years of continuous usage for the $100 of LED bulbs to break even with the CFL’s cost. Obviously, the cost of LED technology will need to come down significantly to make it competitive with CFLs. 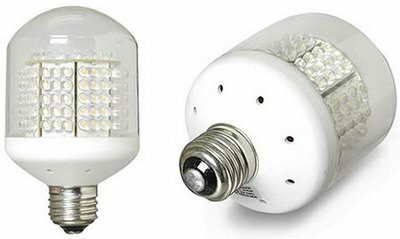 LEDs have the benefit of using no mercury, unlike CFLs which do, but I covered the mercury issue in my CFL article so I won’t repeat it here. I also calculated the beneficial heat that is lost in the winter time when switching from incandescent bulbs. The extra heat generated by incandescent lights helps to reduce the furnace’s heating load, although not by much, just over 1%. I think CFLs will be the heir apparent to incandescent bulbs for indoor applications for quite some time especially when you get above a hundred lumens. LEDs will reign supreme for battery powered applications where light output is less than 100 lumens and where the extra energy savings are vitally important. LEDs will also continue to find their way into applications where environmental ruggedness and long life are important. Your frustration is understandable. It’s always useful when a spokesperson can use terms appropriately and speak to the issue in a way which solidifies their expertise. Thank you so much for sharing this! LED lights have come a really long way!